I’ve been sick again with a cold for the last week and all I have craved is soft comfort food. Cauliflowers are cheap again and I had recently bought two. I had roasted one of them in the oven the previous day. When I woke with a sore throat, I thought of scrambled tofu for breakfast. 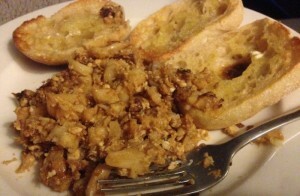 I remembered that I had used roasted cauliflower in a quiche and thought I would give it a try in some scrambled tofu. It was so delicious that I ate it three times over the next two days. This is just an easy scramble of medium soft tofu, pieces of roasted cauliflower, kecap manis and sriracha. I think I am always going to include some roasted vegetables in my tofu scrambles from now on. It adds to the texture and the flavour and lifts the tofu above the ordinary. I ate mine with some toasted sourdough. I feel better now. 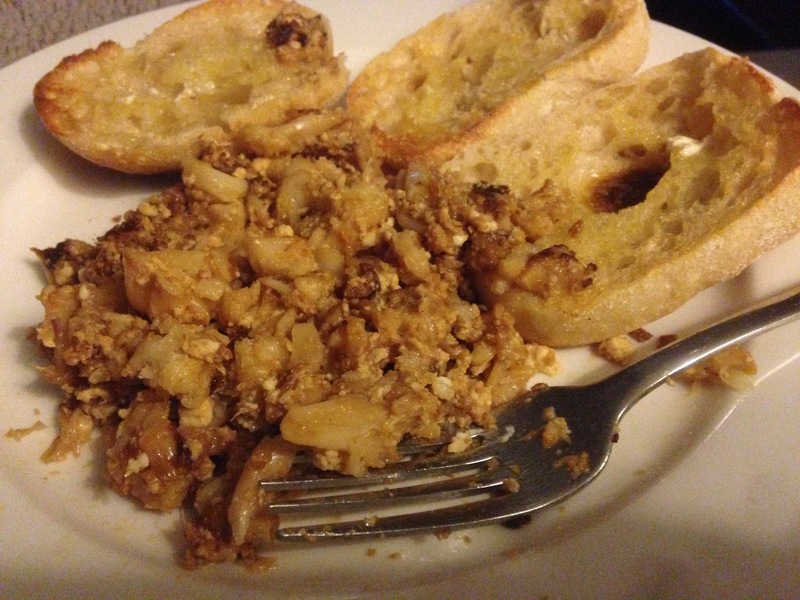 Add the tofu and cauliflower pieces and mash with a fork to a scrambled egg consistency. Fry until it starts to catch slightly, stirring. Stir until well heated and brown. This is a great idea! I’ll add some extras next time I’m putting a cauliflower in the oven. Roasted cauliflower makes everything better.